I was credentialed for a pre-reception media session. 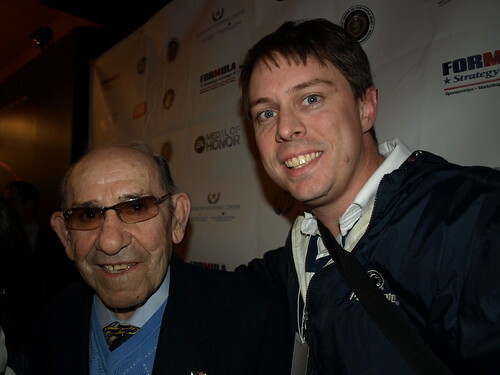 I asked Yogi if being in the military altered the way he approached baseball after the war. Yogi then mentioned that he was in the Navy and served on a rocket boat during D-Day. I was a bit surprised to hear him say that it was like the 4th of July and that he was standing up in the boat to watch before the boat’s officer insisted he get down or he’d lose his head. Yogi complied. Yogi answering a question other than the one that was asked was a recurring theme of the evening. When the panel got going, moderator Phil Wood asked a very similar question of Yogi that I did and got a response about Yogi’s love of sports like baseball, football and soccer, but not basketball. Each of the gentleman was over 80 years old and while they did not necessarily give the answers to the questions asked, they were informative and interesting. As for Yogi, given his endearing and enduring tendency towards malapropisms, I don’t know that he would have answered the question differently if he was say, 30 years old. The four veterans spent about 60 minutes basically former players telling war stories, literally and figuratively. Each panelist talked about his service; Miles was a stateside mechanic for the Tuskegee Airman, Brisse was a solider who probably would have had his leg amputated if he didn’t insist that he was a baseball player, while Coleman was a USMC pilot in WWII and Korea and Yogi talked about being in the Navy. 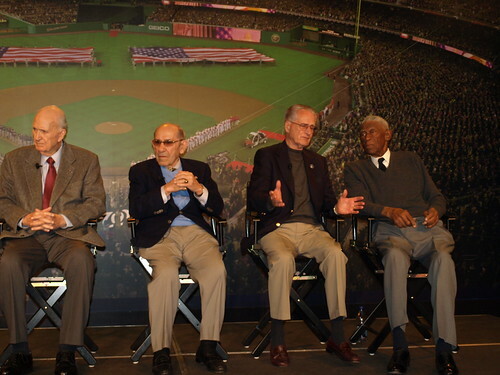 Each of them enjoyed their service as well as their baseball careers. Wood also shared the sad story of Washingtonian Jimmy Trimble, a Washington Senators prospect, who was killed on Iwo Jima. Nationals Daily News has more details about Trimble’s sacrifice. If I recall correctly, 128 minor league players were killed during WWII, while only 2 major leagues fell for their country. The attendance at the event included 3 Medal of Honor winners, servicemen recovering at Walter Reed hospital, West Point cadets, active duty soldiers and guests of AVC. Following the panel, there were informal autographs and photos with the panelists and I was able to get a couple of photos with the two former Yankees. 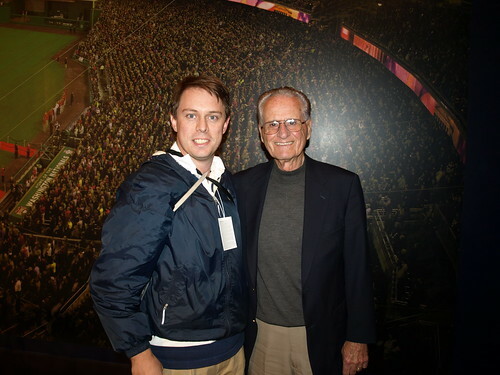 My mother worked for the Yankees while Coleman was still broadcasting games for them. I mentioned to him that she remembered him being a gentleman to which he laughed, “she didn’t know me that well” and then wished her well. I nearly went up to his museum this summer in the hopes of meeting him, but postponed it after Yogi fell in his home and had to be hospitalized. I’m glad I got to meet him here and still look forward to going to his museum. Nats: I can’t wait to ask Stephen Strasburg about playing with Elijah Dukes. Wait, what? !